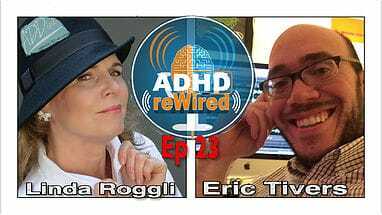 Linda Roggli is a former advertiser, turned ADHD coach and author with a focus on “women 40 and better.” She was diagnosed at about 45, after like many women, she was misdiagnosed with depression and other disorders. She describes her ADHD as smacking her in the face, it was not until she had 3 professional opinions, that she finally accepted that she has ADHD. In this interview, she shares openly about struggles of her past including being seriously suicidal and struggles she had with making friends. We explore what it means to come out of the closet with ADHD, as well as the importance of taking of the masks of ADHD. Her favorite is the Jawbone 24. She uses it to track sleep and so much more. She lables everything with her Brother Label Maker.